Medical staff from both clubs stretcher Bulldogs full-back Johnny Campbell from the field following his injury last Sunday. 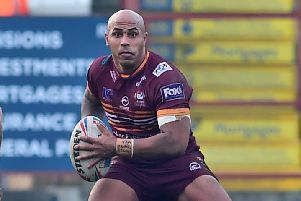 Batley Bulldogs coach John Kear was left shocked by the extent of the serious leg injury sustained by Johnny Campbell during Sunday’s derby against Dewsbury Rams. Kear says he usually watches a re-run of his side’s games on a Sunday evening but was physically shaken by Campbell’s injury. Kear said: “It was an horrific injury and I think it has an effect on everybody at the ground. “It was so bad, the Dewsbury players shielded him from the crowd when he was being treated, because they didn’t want the fans to see it. “He’s got a very serious leg break and a badly dislocated ankle. He has had the ankle put back in, he is going to have to have the leg pinned and then he’ll have a scan to see what ligament damage there is. “I have been in the game a long time and I’ve seen a lot (of this type of injury) and the only one I can compare it to is when Kevin Ward broke his leg playing for St Helens against Wigan. Dewsbury fought back from 12-0 down to win the derby 28-22 and ensure themselves of a place in the Championship Shield semi-finals. Rams boss Glenn Morrison said: “We made it a lot harder on ourselves than it needed to be, but we dug it out. “The two sets in a row in the last minute showed the desire we have in the squad to get the job done and we made sure they weren’t going to score. “At half time I just told them to show a bit more character. “We got some steel in us, defended a bit more like we know we can and got ourselves in to that forward battle. “If you win that forward battle you let the halves create a bit more and produce more opportunities. “Once we did that, I thought we improved and scored some good tries. “It was great to see the boys have a real desire to work for each other. Defeat leaves Batley sixth in the Championship Shield standings, five points behind fourth placed Workington as they face a must win trip to Doncaster on Sunday. Dewsbury have opened a three-point lead on third placed London and they host Whitehaven this week.